We pretty much refuse to eat uncooked tomatoes out of season; however, finding ourselves with an abundance of out-of-season tomatoes, we decided to see if we could improve upon the flavor using the Anova Sous Vide Precision Cooker. We made a sort-of tomato confit and it really intensified the tomato . While we wouldn’t necessarily do this with in-season heirloom tomatoes, we’ll do this again with store-bought tomatoes and serve it with steamed rice or risotto. Set the Anova Sous Vide Precision Cooker to 140°F (60°C). Bring a large pot of water to a boil over high heat. Cut a thin "x" into the top of the tomatoes and place in the boiling water. Boil until the skin begins to peel back, about 1 minute. Immediately transfer tomatoes to an ice bath. Once tomatoes are cool, remove from the ice bath and peel off the skin. Season with salt and pepper. 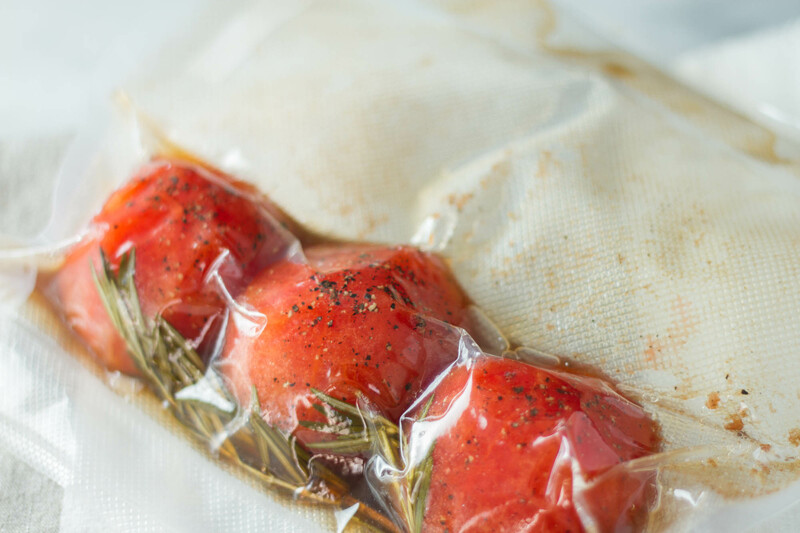 Place tomatoes in a large zipper lock or vacuum seal bag with the olive oil, vinegar, and rosemary. Seal the bag using the water immersion technique or a vacuum sealer on the moist setting. Place the bag in the water bath and set the timer for 45 minutes. When the timer goes off, remove the bag from the water bath. Gently remove the tomatoes from the bag and place on a serving platter. Drizzle tomatoes with additional balsamic and sprinkle with rosemary. Serve.